Brown, Eric, CBE, DCS, AFC, RN. ; Green, William and Gordon Swanborough. 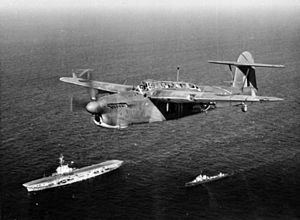 "Fairey Barracuda". Wings of the Navy, Flying Allied Carrier Aircraft of World War Two. London: Jane's Publishing Company, 1980, pp. 99–108. ISBN 0-7106-0002-X. Hadley, D. Barracuda Pilot. London: AIRlife Publishing, 2000. ISBN 1-84037-225-7. Halley, james J. The Squadrons of the Royal Air Force & Commonwealth 1918-1988. Tonbridge, Kent, UK: Air-Britain (Historians) Ltd., 1988. ISBN 0-85130-164-9. Jefford, Wing Commander C.G., MBE, BA, RAF (Retd). RAF Squadrons, a Comprehensive Record of the Movement and Equipment of all RAF Squadrons and their Antecedents since 1912. Shrewsbury, UK: Airlife Publishing, 2001. ISBN 1-84037-141-2.